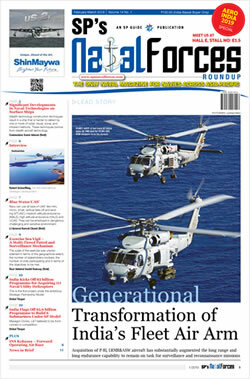 The Indian Navy and Indian Army have for long desired the capability to transport an independent brigade group, 5,000 strong, as part of a fully amphibious force modelled on the US Marines. With India in the process of building and acquiring large amphibious vessels to augment the existing INS Jalashwa and smaller ships, the idea of a marine brigade has found renewed interest among military planners, with the Indian Navy expressing interest in the way the US Marines conduct operations afresh. 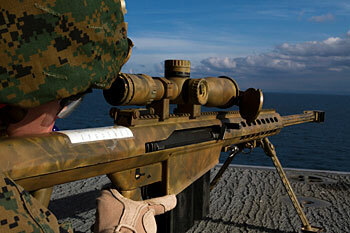 India's interest is visible in the specific interest it has shown in recent events. 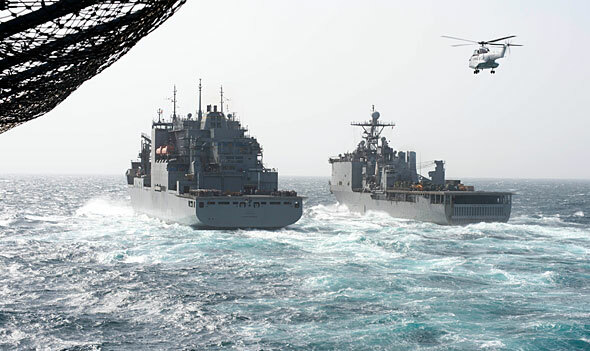 SP's has learnt that the Indian Navy has been closely tracking and following exercises and operations of the USS Iwo Jima, a US Navy amphibious assault vessel that was conducting exercises in the Red Sea at the time US President Barack Obama was in India. 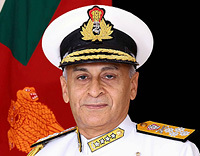 Conversations are understood to have taken place about the possibility of Indian Navy visits to such vessels or exercises, and the inclusion of large amphibious vessels in future MALABAR exercises as well between the two navies. 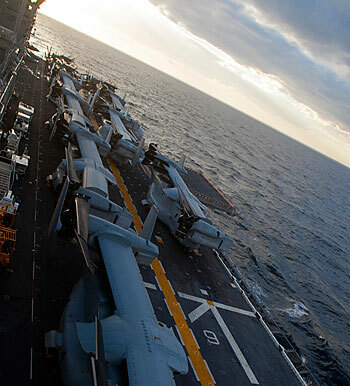 The USS Iwo Jima and the 24th Marine Expeditionary Unit transited through the Strait of Gibraltar late last year, conducting naval operations in the U.S. 6th Fleet area of operations in support of U.S. national security interests in Europe. The ship has on board MV-22 Ospreys from Marine Medium Tiltrotor Squadron 365 (Reinforced), 24th Marine Expeditionary Unit (MEU) — another area of interest for the Indian Navy: air operations in the amphiobious operational context. 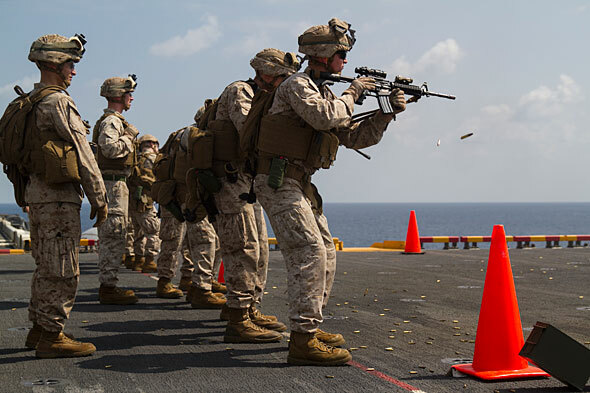 The 24th Marine Expeditionary Unit, as part of the exercise provided security for Marines aboard a notional hostile ship, at sea on Sept. 14, 2014. The Marines conducted a Visit, Board, Search and Seizure exercise during the transit exercise, that spanned over the majority of September. 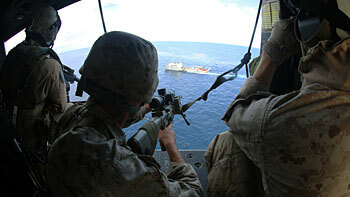 The 24th Marine Expeditionary Unit’s (MEU) Maritime Raid Force, a detachment from Force Reconnaissance Company, 2nd Reconnaissance Battalion, also demonstrated and performed fast-rope operations from a UH-1Y Huey to the USS Iwo Jima (LHD 7) during scheduled training in the Red Sea on Jan 26, right about the time President Obama was in Delhi. 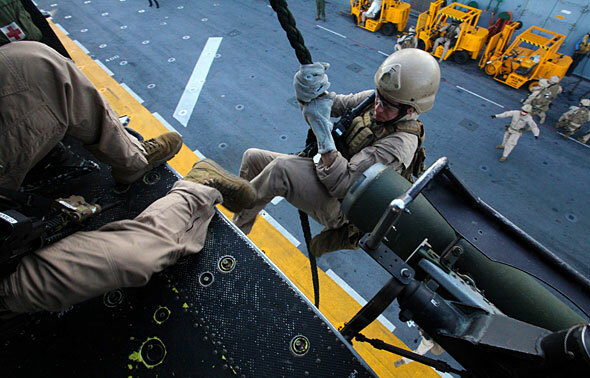 The 24th MEU remains embarked on the ships of the Iwo Jima Amphibious Ready Group and deployed to maintain regional security in the U.S. 5th Fleet area of operations. 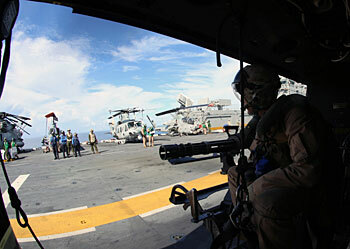 They also participated in a live-fire exercise aboard the ship on Jan 18. 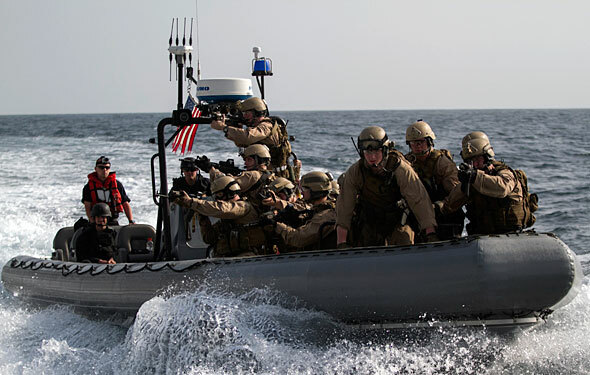 A detachment from Force Reconnaissance Company, 2nd Reconnaissance Battalion, also board a simulated enemy vessel during a visit, board, search and seizure exercise aboard a rigid-hulled inflatable boat, Jan. 15, 2015. 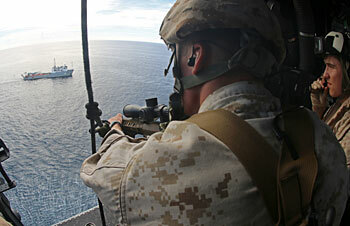 The MRF conducted the VBSS exercise from the amphibious dock landing ship USS Fort McHenry. As part of the closer engagement moving forward, which includes intelligence sharing and officer exchange programmes, India has highlighted amphibious assault operations as a priority area of interest for the Indian Navy. Expect to see this paint much of the visible maritime engagement in the coming months to build on the single amphibious assault exercise already conducted jointly in Andaman islands between the two navies.